Does Apple Make Apple Music Downloads DRM-laden? Yes, it does. Anything you download from Apple Music's streaming catalog is DRM-protected. It is disgusting. The DRM just restricts you from using Apple Music downloads as you want. Is there any DRM removal to remove DRM from Apple Music files? Of course there is. 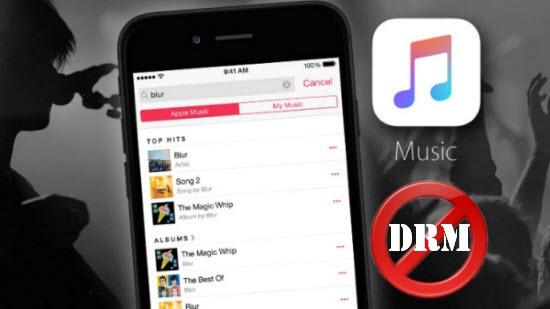 Here the article will introduce you a powerful Apple Music DRM Removal to help you free Apple Music streams from any restriction. Apple adds a DRM layer to its streaming music just like every other streaming services in the market. This keeps you from using Apple Music streams as you want. You cannot download Apple Music streams for offline listening if you do not subscribe it. Even though you subscribe the Apple Music, you just have the right to download them, yet you cannot play the downloads elsewhere on your MP3 Player, car player or other devices. What's more, if you unsubscribe Apple Music, you are no longer granted access to any Apple Music streams you previously downloaded. To free Apple Music streams from DRM protection, you can try iTunes DRM Audio Converter for Mac (or iTunes DRM Audio Converter for Windows), a professional and powerful Apple Music DRM Removal. 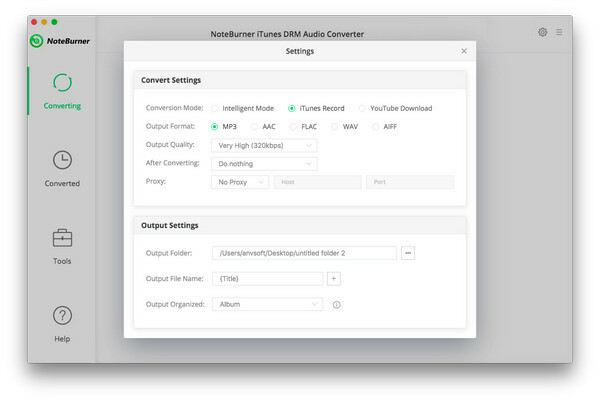 Unlike other simple Audio recorder, NoteBurner iTunes DRM Audio Converter adopts a top-notch DRM decryption technology which enables you to record the Apple Music streams in the background in iTunes at fast speed and keep the whole conversion process in silence. The following image shows the main interface of iTunes DRM Audio Converter. Keep all ID tags and metadata (including track number, title, artist, album, genre and duration). You can download it for a free try. Following the article will guide you how to remove DRM with iTunes DRM Audio Converter in detail. Step-by-step Tutorial: How to Remove DRM from Apple Music Streams? The iTunes DRM Audio Converter is a straightforward app that any user should get the hang of in moments. Here we will take Mac version as example to tell you how to remove DRM from Apple Music songs at fast speed. After downloading and installing the program on your Mac, please launch the program. Click the Add button on the upper left, and there will pop up the adding audio window which shows all your iTunes playlists. Select the Apple Music songs you want to convert to the program. Note: This Apple Music DRM Removal will automatically list all your iTunes music playlist and folders. You can directly choose the music you want to add and add a batch of music files at a time. The adding music will be listed on the NoteBurner interface. Click the setting button to open the preference window. You can set output format either as AAC, FLAC, WAV or MP3. Also, you can set output quality ranging from 56 kbps to 320 kbps. What is more, conversion speed is available to choose. Apart from setting output format, you can also customize the output path. If you do not change the output directory, the output audio will be saved in the default folder. Note: The Apple Music Converter will enable you convert Apple Music files at 20X faster speed with high audio quality. But if the output audio quality is unsatisfied, please slow down the conversion speed . Click the "CONVERT" button to start conversion. 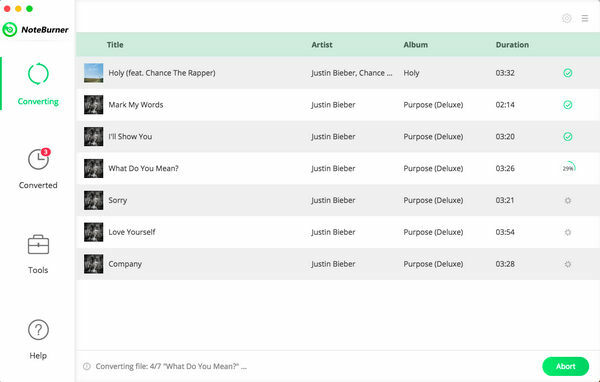 iTunes will start playing the Apple Music you want to convert in the background. The whole conversion process will keep in silence. After conversion, the output folder will be automatically opened. You can find the converted DRM-free audio in the folder. Note: While converting, please do not touch or control iTunes. Or the conversion may be failed. What's next? 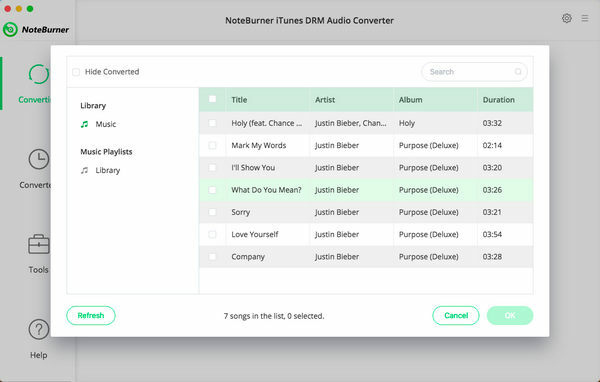 Download NoteBurner Apple Music DRM Removal now!